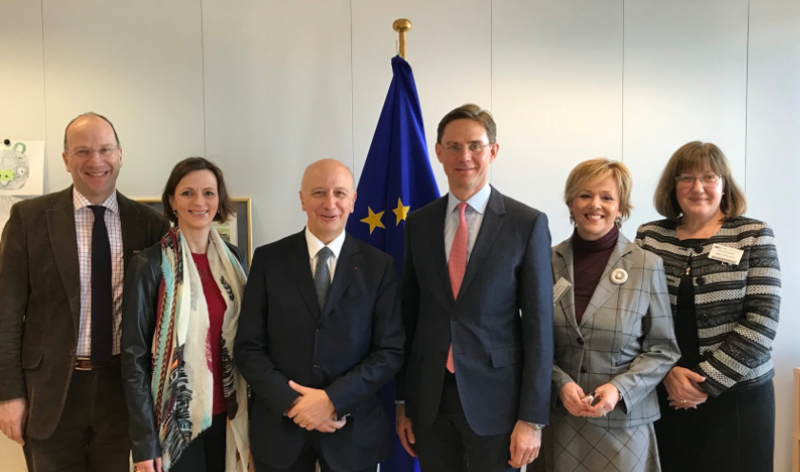 On 27th of February the Presidency of Cooperatives Europe met with Jyrki Katainen, the European Commission’s Vice President for Jobs, Growth, Investment and Competitiveness, in Brussels. A significant recognition from President of the European Commission Jean-Claude Juncker, the meeting follows Cooperatives Europe’s reflection paper titled “A Cooperative Future for Europe.” Through this paper and under the auspice of Cooperatives Europe, national organisations and European sectoral organisations covering all aspect of industry and trade, agriculture, banking and financial services, renewable energy, and housing presented a set of recommendations addressed to EU policy makers to unlock the potential for a wider cooperative economy across Europe. The meeting was an opportunity to present cooperatives and their contribution to the EU. Vice-President Katainen acknowledged the importance of the cooperative economy and recognised cooperatives as sustainable actors in competitive markets. Discussions were also lead on the lack of knowledge on cooperatives and the negative impact of this issue in some countries. Several topics of interest for cooperatives and the sectors were tackled, including entrepreneurship, level playing field, the expert group on social entrepreneurship (GECES), the future of the Multi-Annual Financial Framework as well as collaborative economy. Importantly, Katainen expressed a big interest on a European cooperative collaborative economy – a topic which Cooperatives Europe has addressed through a recent Vision paper “A cooperative vision for the collaborative economy.” The Commission will now be awaiting the action plan from Cooperatives Europe on the development of a cooperative collaborative economy in Europe together with an assessment of challenges, legal obstacles and the different legal frameworks. In addition, the Commission advised on the financing of cooperatives using all funds available, with a specific focus on the EU Investment Fund. Cooperatives Europe, with President Jean-Louis Bancel, would like to thank Vice-President Katainen for the meeting and looks forward to developing on the basis of the very promising and encouraging discussions. We would also like to thank all our members and supporters behind the “Cooperative call for action” and for joining the citizen-lead communication campaign #CloserEurope with #coops, reaching over 700,000 people across Europe and beyond.